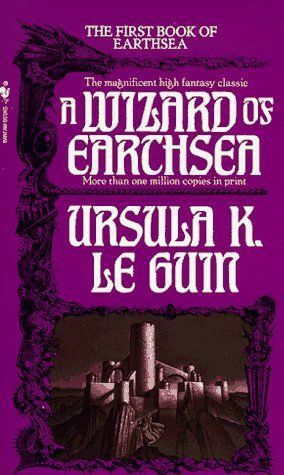 Magic in Earthsea is treated with respect. It’s something those who are not familiar with fear, and those who use it do so with care. But while people fear the magic, they don’t fear the wizard. This is where they’re wrong, and Ged more than proves this point. Ged is raised among those who dread magic, but due to his personality and proficiency in the craft, he doesn’t fear it. He also doesn’t respect it much either. After opening a book of higher magic and accidentally unleashing his shadow, his Master scolds him, “This sorcery is not a game we play for pleasure or for praise” (23). It’s a lesson Ged should’ve and would’ve learned if he’d stayed with the old wizard. But he moves on to Roke Island and enrolls in the School of Wizards where—from the entrance door, to the Long Table, to the students practicing and challenging each other to do spells—magic is everywhere and used for everything. Magic is so common on Roke Island the town’s people don’t find it strange or fascinating. Even with all the warnings to be careful, Ged treats magic lightly. He’s more interested in besting other students and proving he is the best. Ged is often portrayed as being haughty and proud. After learning the magic of Illusion, he complains that it is no real feat because illusions are just ‘foolery’ to which a classmate respond that ‘even foolery is dangerous, in the hands of a fool” (45). And a fool Ged proves to be when, due to his arrogance, he tries to summon a spirit without the required knowledge to do so. The result is the death of the Archmage at the hands of the shadow and serious injuries to Ged himself. It’s his terrible pride that makes Ged a dangerous wizard. Every action he takes, from leaving his old Master to learning everything faster than others, is due to his pride. It says Ged though “the more he learned, the less he would have to fear, until finally in his full power as Wizard he needed fear nothing in the world, nothing at all” (54). Ged soon learns that this is not the case, when he comes face to face with his shadow, a creation brought out by his own power. The story turns in this direction then. Realizing how arrogant and careless he’s been with magic, Ged turns repentant—“since the night on Roke Knoll his desire had turned as much against fame and display as once it had been set on them” (77). Even then, Ged tries to outdo all he’s been taught when he’s called to heal the fisherman’s son. Ignoring Master Herbal’s warning of “heal the wound and cure the illness, but let the dying spirit go” (80), Ged goes after the boys soul and almost ends up dead himself. Ged considers the offer but struggles with the refusal. He’s so afraid of the gebbeth that he wavers, but in the end refuses Serret. The last few chapters show a defeated Ged. He thinks the key to winning against his shadow is acquiring the strongest magic or learning its name in true-speech. But in the end it’s neither; “Ged had neither lost nor won but, naming the shadow of his death with his own name, had made himself whole: a man: who knowing his whole true self, cannot be used or possessed by any power other than himself” (180-181). What defeats the shadow is Ged accepting the truth about himself. The shadow is part of him, the evil, dark, greedy, arrogant part that he’s been battling with all this time. In accepting his true self, he gains full control over himself and his magic.